ESIC West Bengal UDC Previous Papers are provided on this page to gain a better score in the UDC (Upper Division Clerk) exam. In the below sections, we had given the Employees’ State Insurance Corporation (ESIC) Sample Papers along with the answers. Candidates have to download the www.esic.nic.in Upper Division Clerk Solved Papers from this article and begin your preparation for the exam. Applicants can get more stuff on the www.esic.nic.in Upper Division Clerk Exam Pattern 2019, and কর্মচারী স্টেট ইন্সুরেন্স কর্পোরেশন Selection Process. With the help of these ESIC West Bengal Stenographer Previous Papers, competitors can easily crack the exam with good score. The higher officials planned to conduct the Stenographer Exam in the month of May 2019 at multiple examination centers. The examination centers list will be displayed in the official site @ www.esic.nic.in. In the below sections, you can get the complete data on www.esic.nic.in West Bengal Exam Pattern 2019 for the UDC (Upper Division Clerk) & Stenographer Posts. NOTE: The working knowledge of PWD Candidates who are unable to type shall be assessed by holding an Objective Type Computer Test of 50 Marks having 50 Questions with no negative marking. Computer Skill Test and Stenography Test will be qualifying in nature. Marks obtained will not be reckoned for merit ranking. The higher authorities of Employees’ State Insurance Corporation will assign the selection process for the UDC (Upper Division Clerk) & Stenographer Posts. We have noticed that a huge number of applicants are searching for various sites on the internet for ESIC West Bengal UDC Previous Papers, but they are unable to get exact information. 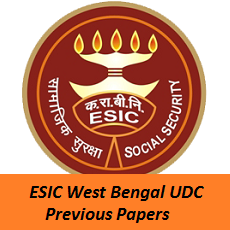 To help those type of applicants, we had inserted the direct link of ESIC West Bengal UDC Previous Papers – Stenographer in PDF format for free of cost. Visit Sarkari Recruitment for more updates on ESIC West Bengal UDC Previous Papers.